The Shamrock was the brainchild of William Curtis, a Californian restaurant equipment manufacturer. The story goes that while visiting his wife’s family in Ireland, he was struck by the terrible poverty and decided that he would build a luxury automobile in Ireland and export it and sell it in America. Curtis believed this would be a great way to help the Irish people and economy. He was 25 years old when he started dreaming up the Shamrock, and was 27 when the first prototype was rolled out in 1959. 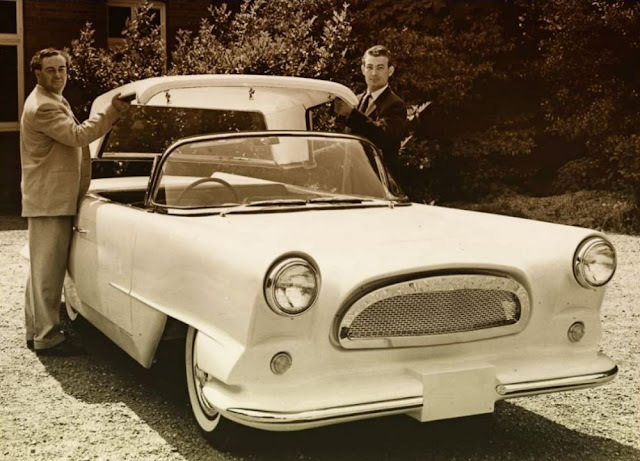 The left-hand drive, two-door, four-passenger second-generation fibreglass sports car was designed by Alvin ‘Spike’ Rhiando, a Canadian ex 500-cc Formula 3 racer. As you can tell from the photos, he clearly had no clue about designing cars. It was nicknamed the Irish T-Bird as it looked like the 1957 Thunderbird, crossed with a Studebaker Hawk from the rear. The one-piece moulded fibreglass body was built on a ladder frame with a 98-inch wheelbase but had such long overhangs that it was described as looking more “like a parade float than a car”, especially considering its 51-inch front and 49-inch rear track. 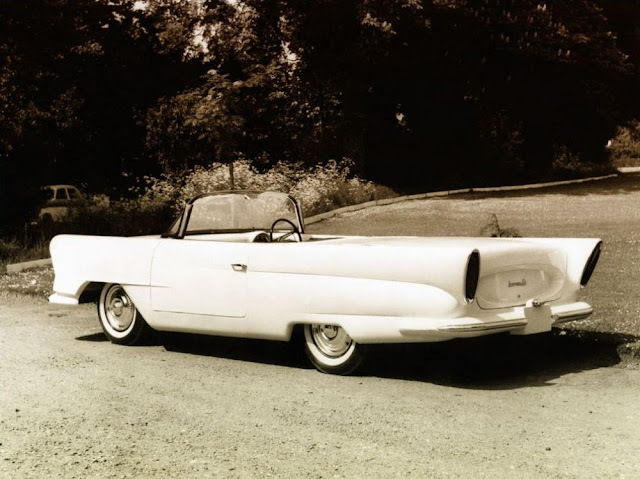 The 17-foot convertible had fin-tail styling and a wrap around windscreen that came from Vauxhall. 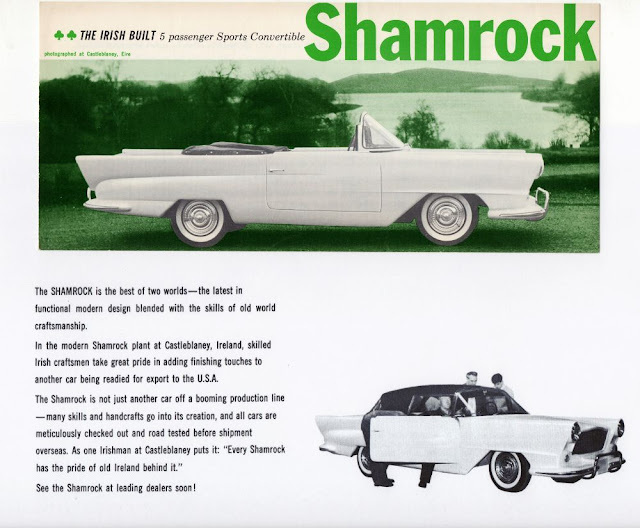 Shamrock never published the car’s overall length, but this view suggests that the front and rear overhangs combined were about two-thirds as long as the 98-inch wheelbase. A removable hardtop offered some protection from the sun, but a lack of side glass meant little refuge from wind and rain. 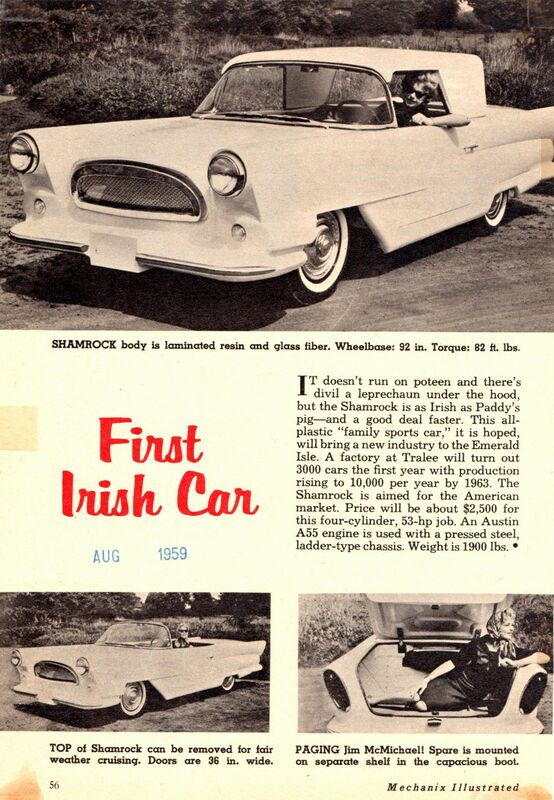 The Shamrock was to be built in Tralee in County Kerry but that didn’t work out. So Curtis opened a 40,000 square foot factory in Castleblayney in County Monaghan to manufacture the car. In 1959, Curtis told Motor Trend that the car would cost $2,495 and 3,000 of them would be produced a year and shipped to the US. However, this didn’t happen. Production came to a halt as nobody wanted to buy the Shamrock. It was too big for the British and it was too small and underpowered for the Americans. Press release photos for 1959 Shamrock. Shamrock literature offered precious few images of the car’s cabin, but several shots of women reclining in the trunk. Rumor has it that after the factory closed, the fibreglass bodies and other parts were dumped into Lough Muckno. It is believed that just eight to ten cars were produced making the Shamrock a very rare car. Five are still in existence in Ireland and three are in America and you can usually see one of these in the St Patrick’s Day parade – the perfect place for a car that looks like a float. The car seen in this promotional image wears what appears to be a folded soft top. Production vehicles did not include a folding top. 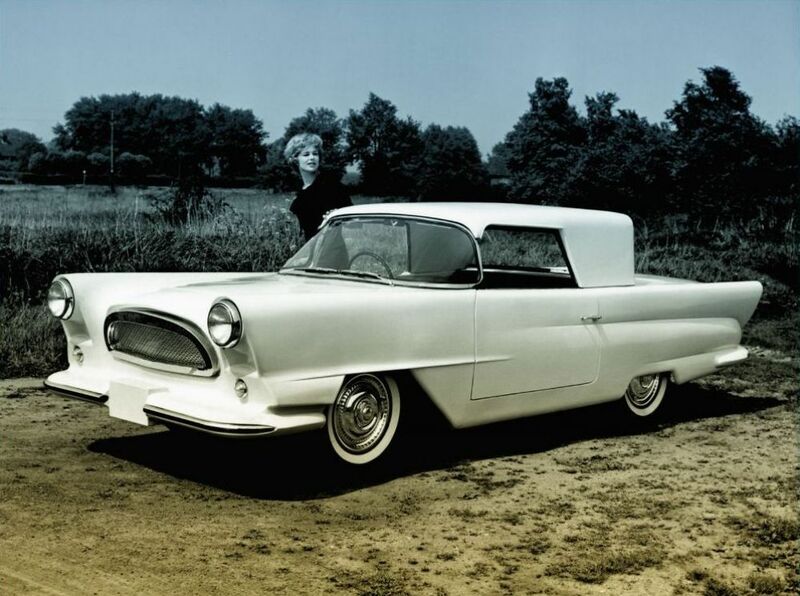 Allegedly only four of these fiberglass-bodied cars were produced. 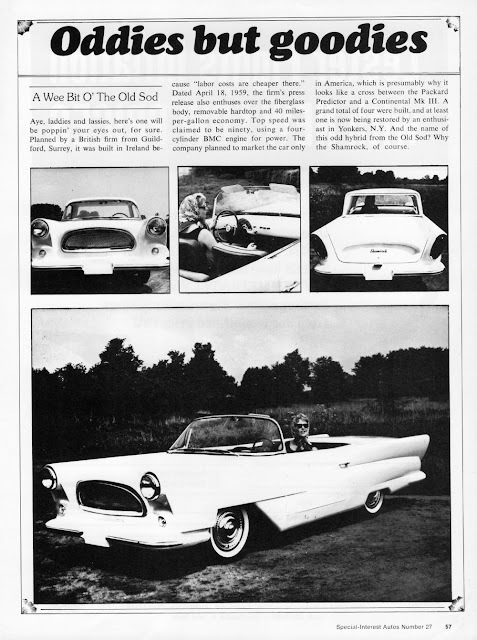 Dubbed "The Irish T-Bird" in some other magazine articles.